You don't really notice how big a X5 is until you see one up close. Seeing one on the road doesn't do it justice. It wasn't until we sized it up against its smaller brother, the X3, did we realize how large its presence actually is. The one we purchased, particularly the 4.8i trim just looks mean (in a good way). It stands out with the larger exhausts in the back (compared to the 3.0si), and the metallic brushed kidney grilles on the front. Because it was modified for 2007, the back taillights are more refined and not as bulky as they looked for the first generation vehicle. 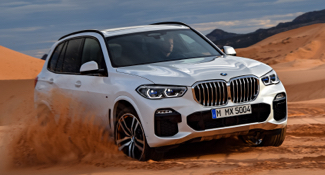 The exterior is fresh, the lines are good and it immediately comes off as a solid SUV, or as BMW calls it, SAV. Inside, the materials are everything you'd expect from BMW with the wood grain trim, leather seating, steering wheel, etc. The buttons are arranged simplistically and are not overwhelming as you sometimes find in other vehicles. If you've driven any other one of BMW's lineup before, you know where to find buttons - particularly the lock/unlock button, which is found underneath the main air vents in front (there is no lock/unlock button on the driver's or passenger doors). The seats are very comfortable and ours had multi-way adjustable seats. You sit up high and have a great view of the road which makes you forget you're driving a big SUV on the road. Of course when it comes to turning and parking in tight spaces (when you've previously owned a sedan or hatchback), there is a little bit more attention required. The side mirrors are huge to eliminate any blind spots and we always like to add the blind spot mirrors you can get to help increase visibility. It is very roomy in the back and tall adults would have no problem stretching out. We have a convertible car seat installed forward facing and you didn't need to move up the passenger's seat at all. Our version does not have third-row seating so we do have quite a bit of cargo space and the rear seats can fold down flat for extra room. The trunk is unique in that it splits into two parts. The gate will lift up but then you still have the bottom third you need to pull down by grasping a lever and pulling it towards you. I think it helps if you needed to slide a big item off or need extra leverage. It isn't that big of a negative though. It drives well. The 4.8i has around 350hp so there is plenty of get-up-and-go. Braking is sturdy and responsive. You do develop that sense of being able to tackle anything and you definitely notice how much higher you are off the road than most vehicles. Going back to the engine size and power, it does compromise on fuel efficiency. I believe it is only rated at 15/22 compared to 17/23 for the 3.0si version. It's a monster at the pump with a 22.5 gallon tank (around 2.6 for reserves according to the manual). It of course recommends premium fuel but will accept as low as unleaded. As someone who has owned 2 other BMWs, the X5 is no different. It feels smooth, accelerates nicely, and the fact that AWD comes standard is a big plus so you can be prepared for any climate. Relating to repairs, obviously BMW repairs aren't cheap. If you can't do it yourself or your car is not under a warranty, just take it to an independent dealer for repair. We did have to replace all the spark plugs and some other items as it didn't appear the previous owner did it at 100,000 miles, and because the X5 requires iridium spark plugs ($28 a piece), it was about $750. Thankfully these are supposed to last 100,000 miles so it should not have to be done again. Great vehicle, just be aware that you are getting what you pay for and be mindful of keeping it well maintained! It got rearended on an interstate highway in pouring rain in morning rush hour traffic and subsequently pushed into a trailer hitch of a Honda Pilot in front and the damage is relatively minimal. It clearly is a well-made vehicle and the fact that it withstood the crash and kept its occupant safe was a big plus. Stylish exterior, stands out of the crowd, drives well, good handling. This trim had front and rear heated seats, as well as a heated steering wheel, back-up camera, navigation. Overall roominess of the vehicle. All iDrive systems prior to 2009 are a little difficult to navigate, so it definitely takes some adapting and reading of the manual to figure out what all the system is capable of and where certain things are housed (e.g. vehicle locking preferences, clock hourly chime tone). 2003 BMW X5 - This vehicle is a money pit! Buyer beware! I bought this vehicle used a year ago. Initially it performed wonderfully and the seats were extremely comfortable, the navigation worked perfectly, and the interior and exterior condition were still clean and modern, but after about a week, the air suspension went out, and after a month the clutch began slipping, the coolant container was replaced but already was cracked and leaking again, the TCM and ECM modules developed hardware problems, and the transmission is failing. The vehicle does not even have 120,000 miles on it yet. Apparently these are all extremely common, and costly problems that occur on almost all BMW X5s at some point, before they even reach 200,000 miles. I haven't not even been able to drive this vehicle for more than 5k miles in the year I have owned it. This car is not reliable in the least! However, since I go hiking and camping with my dogs a lot, the fact that the backseats fold down to become flush with the trunk, it gave my dogs a lot of room to move around while we drove fairly long distances, and the roof racks were easily able to accommodate the Thule that was filled with all of our camping and hiking gear. Since I went hiking with my dogs a lot, this vehicle, when it worked, did provide amazing MPG and was very spacious. My favorite memory was when we first got the vehicle, and everything was working flawlessly, and my dogs were extremely excited about the space when they first jumped in (since they were used to a small car previously). During this first hiking/camping trip, it was fun to be able to use the AWD features, as well as the stronger engine, to go through rougher terrain that we normally would not be able to go through (for example in Sedona), without any issue or worry. We had great videos and photos of this trip because we were able to go to new locations that we were not able to drive to before! The interior is very nice and durable; the heated seats are a wonderful feature that heat up very well; the outside design is very timeless and still matches current styles, even 15 years later. The backseat offered a lot of room when folded down, and the rear air conditioner worked wonderfully (it could either be as cold as ice, or as hot as the sun) and was just as strong/great quality as the front. For a AWD 4.4L vehicle, the mileage was great, and when the vehicle was working, it was a very smooth ride (you couldn't feel any bumps in the road which was amazing). It was very reliable in rough terrain driving, and could handle driving up mountainous roads with no issue (without losing speed). A lot of mechanical issues that are extremely costly and cost more than the vehicle is even worth; once there is one minor electrical issue, it spirals into multiple hardware issues that you cannot even fix on your own, and seem to be reoccurring in hundreds if not thousands of other vehicles of the same make and model, and these repairs are not covered by BMW and have not been recalled by BMW, even though it is a problem with their product. I love my X5. I was a previous sedan owner and was nervous about getting an SUV—however, this car does not disappoint. Its acceleration rate is just as good if not better than my sedan was. Its comfort level is off the charts. It feels as though I am driving a smaller car because of how smooth the ride is. Having recently had two surgeries, my car has been wonderfully smooth to ride in and comfortable (especially with the heated seats). One of my most memorable stories was having my mother visit and drive my car for the first time. To see the shock and joy at how quickly the car accelerated and how fast it was—it really was a treat. She was also so blown away by all of the features that she returned home ready to purchase one of her own. My favorite thing about my vehicle is all of the safety features. BMW really has thought of everything to keep the driver aware and safe. My favorite features are: birds-eye camera view of the vehicle, parking assist, back-up camera, lane departure and collision detection. The only downfall that I can think of, is that everything is a little too automated and all digital. So if anything goes wrong with my electrical panels, I lose access to a lot of the key features that are needed to drive. They are wonderful features of convenience. However, to have them all digital does make me a little nervous if I ever have any problems down the line.